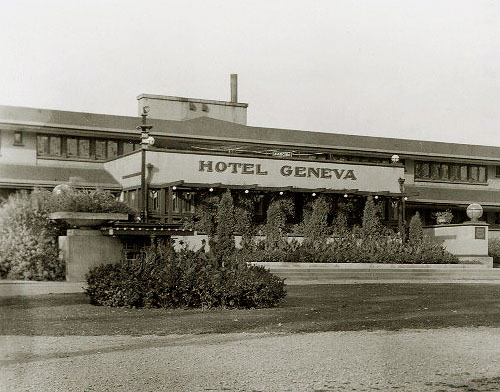 1935-19456 .They are important because they give a picture of the Hotel Geneva in a more original state before changes were made. Gilman Lane images courtesy of the Oak Park Public Library, Gilman Lane Collection. 1: Viewed from the Southwest. 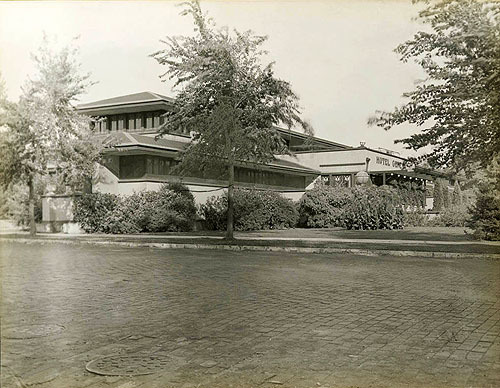 Strong horizontal lines, low-pitched roof, broad overhanging eaves, horizontal rows upon rows of leaded glass windows. The Dining Room is on the left, the lobby is on the right. Compare this view to Nickel #2. 1a: The open Gallery or Terrace that ran along the side side was later enclosed on the West end of the building (see Nickel 2a). 1b: Detail of the Lobby/Loggia. An addition was added to the West side of the Lobby which enclosed the stairs. 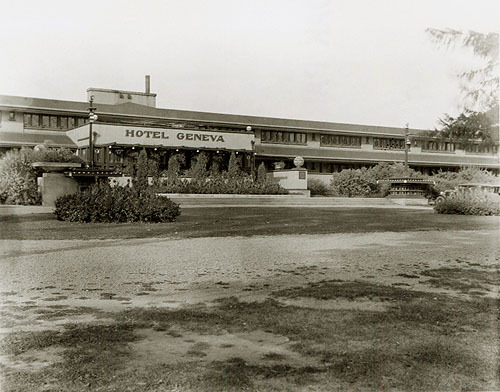 The trellis that ran along the South end of the Lobby was later removed. The wall enclosure is visible just to the right (west) of the Lobby. It was later removed. 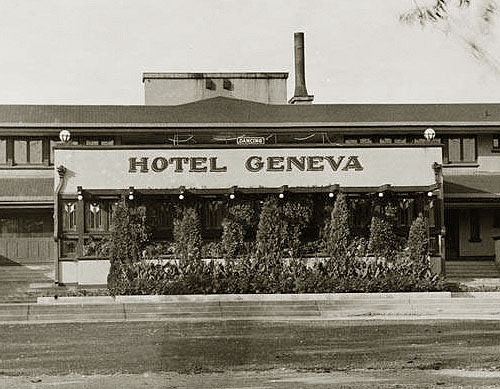 The “globe” light fixtures did not exist in earlier images. 2: Viewed from the Southwest. 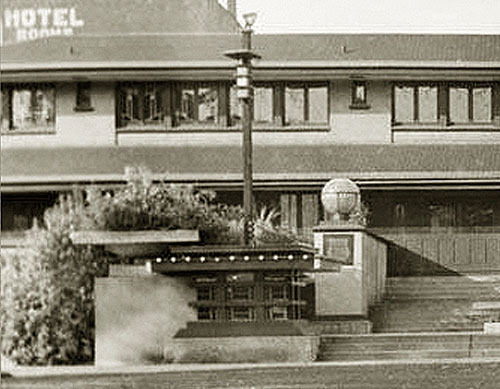 The entrance to the Hotel was up a wide set of stairs with a decorative “light pole” and vase on either side. Then up a flight of stairs on the left and right of the Lobby, to the Open Gallery that ran the full length of the South side of the building. And finally through a set of doors just to the right or left. 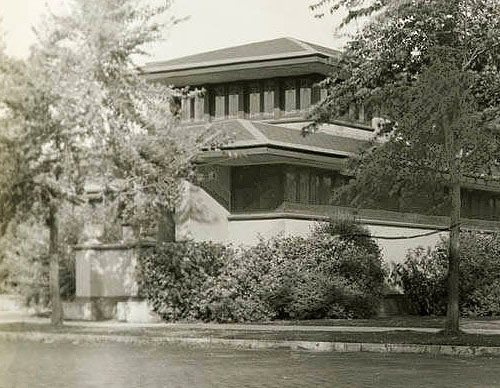 As Wright often did, he obscured or hid the entrance from view. 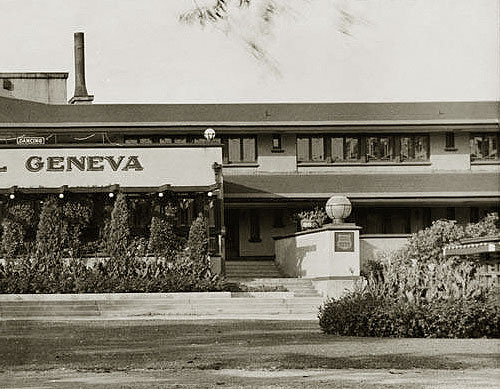 2a: Detail of the entrance to the Hotel Geneva. 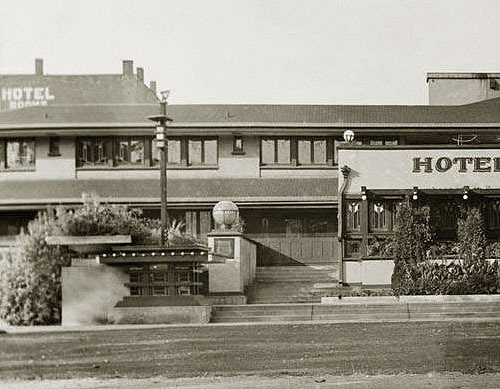 The “globe” light fixtures did not exist in earlier images. 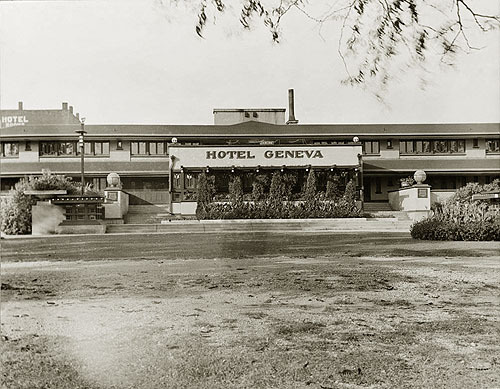 2b: Detail of the entrance to the Hotel Geneva and the decorative “light pole” (see 3d detail) to the right. Early images show the vertical pole to be 4.5 to 5 times the height of the decorative “light pole” base. When comparing the size of the cars to the right, it shows you the size of the “light pole” base. 3: Viewed from the South. The decorative “light pole” and vase on the left is very visible. 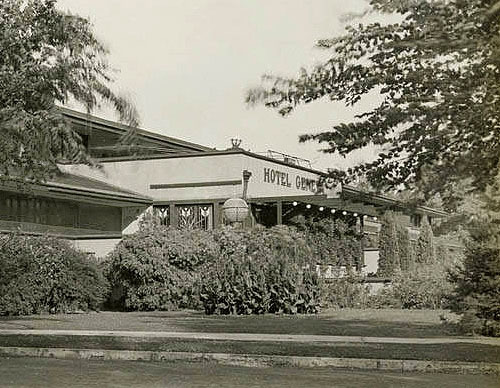 The “globe” light fixtures did not exist in earlier images. It appears that the entrance at the top of the stairs on the left side of the Lobby has been walled off. The shadow seems to indicate that. 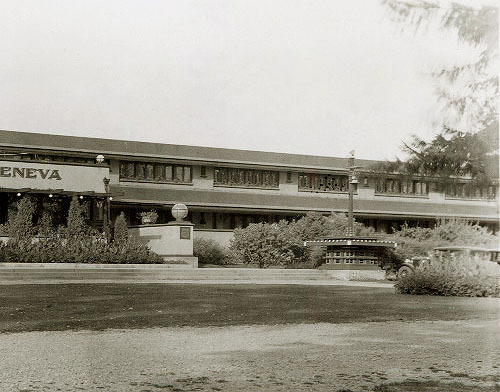 The lower row of windows in the front of the Lobby (South side) are very visible in this image. 3a: Detail of the decorative “light pole” and vase on the left. Early images show the vertical pole to be 4.5 to 5 times the height of the decorative “light pole” base. 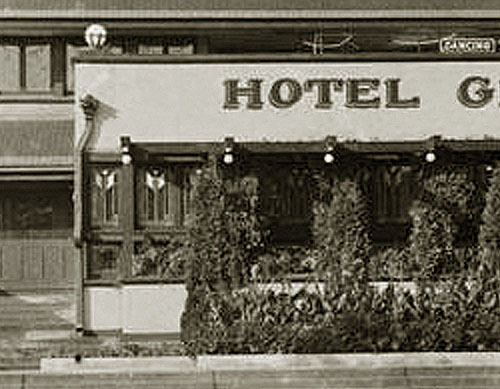 The “globe” light fixtures did not exist in earlier images. It appears that the entrance at the top of the stairs on the left side of the Lobby has been walled off. The shadow seems to indicate that. The lower row of windows in the front of the Lobby (South side) are very visible in this image. 3b: Detail of the South side of the Lobby. The lower row of windows are very visible on the left side. 3c: Detail of the Lobby entrance on the right side. 3e: Enlarged detail of the Southwest corner of the Lobby. The lower row of windows are very visible on the left side. Gilman Lane images courtesy of the Oak Park Public Library, Gilman Lane Collection.